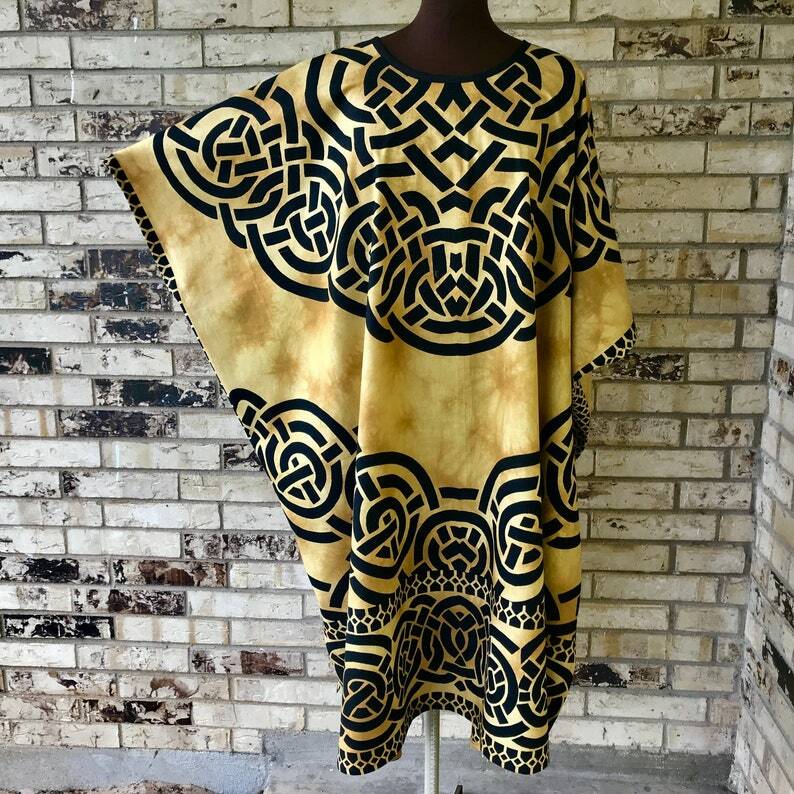 Celebrate your love of Game of Thrones and The Vikings and St Patricks Day with a celtic caftan. The neck is bound to prevent any sort of stretching and all seams are completely finished to insure that the inside of your garment is as lovely as the outside. It is sized to fit almost everyone up to 5X. We would suggest washing your garment separately in cold water by hand or on gentle machine cycle and drying on a hanger or gentle dryer cycle. Because it is cotton it may need to be pressed lightly. As with all hand painted/batik fabrics slight imperfections or variations in color or design my occur which means no 2 will ever be completely alike. on the same day) and then provide you with a confirmation number so that you may track your package. All shipments will be priority mail/U S Post Office. The price listed is for U.S. shipping only - please contact me for International rates. If you have any questions regarding this item please feel free to e-mail us and we will get back to you as soon as possible. Always from a smoke-free home. Perfect and beautiful. Good quality. Shipping was fabulous as I received the order within a couple of days. I love love love this fleece caftan. Delivery was quick and the price was right. I had to hem it but that was expected. Would love to see more of these; I would live in them all winter! Ships fast and quick, I couldn't be happier! Another happy repeat buyer, Thanks!